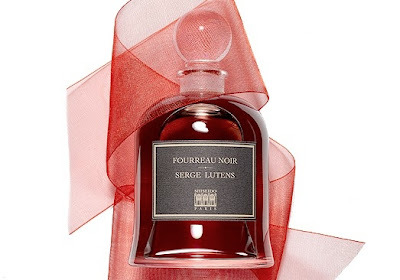 Even those of us who love Serge Lutens to death probably ought to be willing to admit that the names and descriptions he gives his perfumes are often less intriguing or mysterious than, well, silly. Certainly over the top. Case in point: Fourreau Noir. The wax sample of the scent gives as its description "De la nuque au fourreau," which, if you believe Google Translate, means "from the nape [of the neck] to the sleeve." What? The booklet accompanying the samples says "Un note, une fluide", which ought to be obvious even if you don't speak any French, but which is still baffling, since there is more than one note, and all perfumes are fluids. And the website says only, "Un empreinte," "a fingerprint." Seriously: what? As for the name, a fourreau is a sheath; the implication of a fourreau noir, a black sheath, is that it's a garment of some sort, but it can also be the kind of sheath that hides a knife. 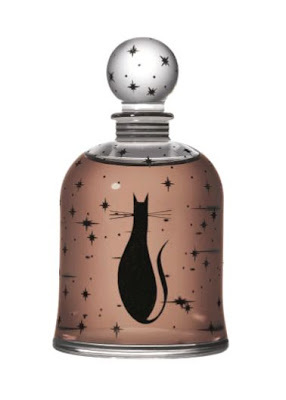 Given this, wouldn't you think that a scent called Fourreau Noir would either be femme fatale mysterious or conceal a steely, threatening core inside a simple, maybe leathern scabbard? It isn't feminine; it isn't recognizably a women's scent at all. It doesn't really hide anything; everything is pretty much out there in the open. It doesn't have even a whiff of danger to it, unless you consider smoke to be dangerous. It seems instead to be a fascinating variation on that standby of men's perfumery, the fougere: darkened almost jet-black, damped down, eventually sweetened to the point of gourmanderie, but for all that a fougere. A fougere will have lavender, but it is just barely present in the top of Fourreau Noir: so different from the icy, otherworldly lavender of Gris Clair, it barely reads as lavender to me at all, because it is enshrouded with smoke and paired with what seems to be black licorice--the candy pipes that Demeter did so well, but blacker even than that, barely sweet. It is hypnotic. Over time, the lavender grows in strength and stature--there's the fougere!-- while the licorice bafflingly gives way to immortelle, a sweet maple-syrup floral, and the smoke becomes more imposing, though never particularly heavy: there is the suggestion of the hookah from Ambre Narguilè. After reaching this tipping point, there's nowhere for Fourreau Noir to go but sweeter and denser: tonka bean and vanillic almond start to take over, and hours later--many hours later, certainly twelve, maybe sixteen--they're still there on the skin, though magically never quite losing that fougere-lavender quality. Lutens calls the bottles "flaçons de table": in English, we usually call them "bell jars" because of their shape. Do I even need to tell you that you can't buy them in North America? I got mine when I was in Paris last spring: I smelled pretty much everything in the entire place except the half-dozen I already owned, but it was Fourreau Noir that spoke most insistently to me. I required it. It took me until yesterday to open the bottle, as if I had to prepare myself. It was worth the wait. Good news: There was at least one when I was at the Palais in July.